The Mano River Union, consisting of Guinea, Liberia and Sierra Leone, was established in 1973 to constitute a customs and economic union between the member states in order to improve living standards. Decisions are taken at meetings of a joint ministerial committee. Since 1990, sustained conflict in the Mano River basin has spread across borders and engulfed the region in a severe humanitarian crisis. Charles Taylor, a protégée of Libyan dictator, Col. Mu'ammar al-Qadhafi, seized power in Liberia spread terror throughout Sierra Leone, Ivory Coast and Guinea. By mid-2003 Great Britain was able to restore peace to Sierra Leone and continue to do what they can to maintain peace. And the French were attempting to restore peace to Ivory Coast. On December 24, 1989, a small band of Libyan-trained rebels invaded Liberia from the Ivory Coast. Led by Doe's former procurement chief, an Americo-Liberian named Charles G. Taylor, they drew on the Gio and Mano tribes. Fighting and looting on both sides of the Liberian-Ivoirian border was fomented between members of the respective Krahn and Guere ethnic groups with their Gio and Yacouba neighbors. As Taylor consolidated power in Liberia, in neighboring Sierra Leone fell to a Taylor-backed armed rebellion. Rebels calling themselves the Revolutionary United Front (RUF), back by Taylor's NPFL forces, invaded Sierra Leone from Liberia. The RUF was led by Foday Sankoh, another of the Libyan-trained revolutionaries who had fought alongside Taylor. As the RUF consolidated control of the diamond rich areas of Sierra Leone, a Taylor-backed armed insurgency also flared up in neighboring Guinea. The armed hostilities were also concentrated in Guinea's diamond rich areas. Liberia accused Guinea of backing rebels who had fought the Liberian Government to a standstill in the north. Following the September 11, 2001 terror attacks in the United States, the Washington Post reported that terrorist mastermind Osama bin Laden's al Qaeda network had purchased tens of millions of dollars worth of diamonds from RUF rebels through Liberia. For Sierra Leone, Liberia, Angola, the Congo, and Guinea, diamonds are a curse. They are a magnet for bandits, who seize diamond mines and trade their production for weapons, narcotics they use to numb their fighters to the tasks they demand, and the other materiel these big armies need. Diamonds in those countries are close to the surface and spread over large regions, so it is much harder to patrol mining done there. Because of that, and because the legitimate industry is so willing to help rebels launder their stolen gems, neither these countries nor the United Nations has been able to fend off these rebel forces. The terrorist network led by Osama bin Laden has reaped millions of dollars since 1998 from the illicit sale of diamonds mined by rebels in Sierra Leone, according to US and European intelligence officials and two sources with direct knowledge of events. While peace and progress towards democracy has prevailed in Sierra Leone, violent conflict has resulted in the displacement of affected populations in Liberia. Guinea, Liberia, and Sierra Leone continue to require international assistance to meet the humanitarian needs of internally displaced and refugee populations. As of June 2002, nearly one million displaced persons remained in need of humanitarian assistance. Between 1990 and 2002, the US Government provided the Mano River region with more than $950 million in emergency humanitarian assistance. The Mano River sub-region, which includes the Parrot's Beak area of Guinea, Liberia's Lofa County and the Kono and Kailahun Districts of Sierra Leone, has been the location of persistent conflict for over a decade. Guinea, at great cost to itself, has hosted up to a million refugees due to conflicts in this region that borders both Sierra Leone and Liberia. In addition, Guinea has also taken in refugees from neighboring Guinea Bissau as well as the Casamance region of Senegal, giving it at one time the dubious distinction of hosting the largest refugee population in the world. The result of these on-going cross-border and regional conflicts has been massive human suffering, social dislocation, and the destruction of what was once a flourishing regional economy. After Liberia accused Guinea of sanctioning attacks by Liberian dissidents from Guinean territory, the town of Macenta in the Forest Region of Guinea was attacked in September 2000. Forecariah and Kindia in Coastal Guinea were then targeted before the drive into the Forest Region of Guinea resumed in December 2000 with devastating attacks on the important town of Gueckedou and surrounding villages. The attacks, which occurred sporadically between September 2000 and March 2001, forced 250,000 inhabitants of the Forest Region to flee to Upper and Middle Guinea and necessitated the emergency transfer of some 60,000 refugees to areas of greater safety, deeper in Guinean territory. 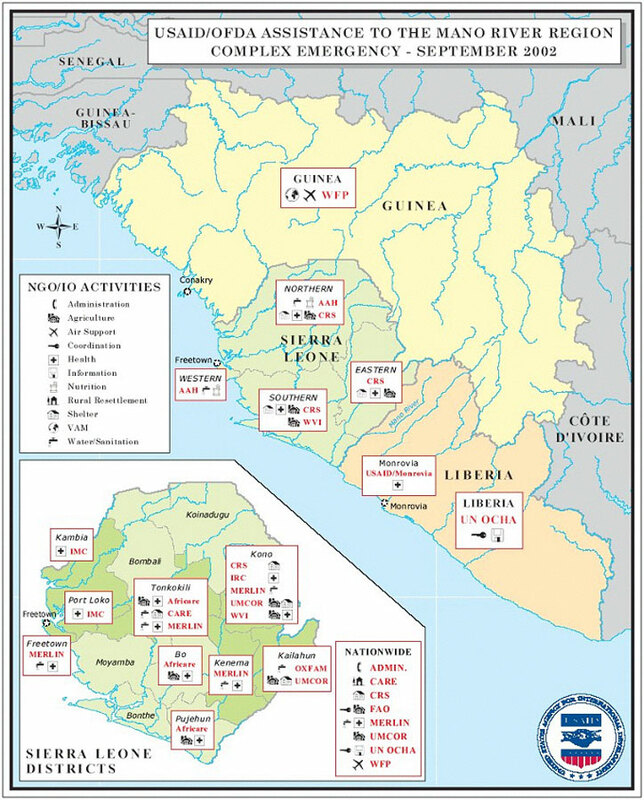 An estimated 80,000 Sierra Leonean refugees from the Parrot's Beak area returned through RUF-controlled territory to Sierra Leone without any assistance. USAID's implementing partners and other international development workers withdrew when the conflicts intensified. The Guinean forces assisted by local civil defense volunteers vigorously defended their borders, inflicting heavy damage on the RUF, that, combined with the effective response of the British forces, led to an acceleration of the demobilization process of RUF forces beginning in the Spring of 2001. With the demobilization and disarmament process in Sierra Leone now completed, the sub-region appears to be finally moving towards peace. The security situation has been stable throughout most of Guinea since late 2001. However, as a result of renewed fighting in Liberia, more than 13,000 new refugees had entered Guinea since May 2002. The new arrivals, mostly women, children, and the elderly, report continued problems with Liberian security restrictions when attempting to cross into Guinea. On September 11, 2002, security ministers from Guinea, Liberia, and Sierra Leone pledged to renew peace-building efforts in the region during a two-day meeting in Freetown, Sierra Leone. The Mano River Union ministers agreed to conduct a border tour comprised of high-level officials from each of the countries in December 2002. The meeting continued an initiative launched in Morocco in February, during which the Presidents of the three countries agreed to increase security along the common borders, support refugee repatriation, continue assistance for displaced persons, and reactivate economic development through the Mano River Union. The security situation has been stable throughout most of Guinea since late 2001. However, as a result of recent fighting in Liberia, more than 13,000 new refugees have entered Guinea since May 2002. The new arrivals, mostly women, children, and the elderly, report continued problems with Liberian security restrictions when attempting to cross into Guinea. Results of the Government of Guinea (GOG) census of internally displaced persons (IDPs) have yet to be published, and estimates of the number of IDPs in Guinea range from 100,000 to 300,000. On 17 August 2002, UNHCR launched a major beneficiary registration in three refugee camps in southeastern Guinea. The registration will allow non-governmental organizations (NGOs) supporting the camps to update statistics on the characteristics and size of the current refugee population. On August 31, UNICEF reported that the number of registered refugees from Liberia and Sierra Leone totaled 94,402. However, thousands of additional unregistered refugees have established unauthorized settlements or are residing with host families. According to a 27 September 2002 World Food Program (WFP) report, all humanitarian activity in the Koyama sub-prefecture, near the Liberian border, had been suspended following armed confrontation between the Guinean army and unidentified armed assailants, presumed to be from Liberia. The conclusion of the Marcoussis agreements, reaffirm the importance of respect for Côte d'Ivoire's territorial integrity and institutions and provides for the establishment of a government of national reconciliation and the disarmament of rebel groups. Recent reports of atrocities and lawlessness in the western area of Côte d'Ivoire along the border with Liberia have already driven several hundred thousand people from their homes and threaten to develop into a major humanitarian crisis. Continued fighting in Liberia particularly in Lofa province, and the appearance of a new war zone on the frontier with Côte d'Ivoire, preventing the stabilisation of the political situation in the Mano River countries - Guinea Conakry, Liberia and Sierra Leone - and improvement of the humanitarian situation in these countries. Numerous violations of human rights and international humanitarian law that have taken place in Côte d'Ivoire since 19 September 2002. The provisions in the Linas-Marcoussis Agreement for the formation of a government of national reconciliation called on all Ivorian political forces to work with the President of the Republic and the newly appointed Prime minister towards the establishment of a balanced and stable government. The parties concerned worked jointly with the 'monitoring committee' chaired by the UN Secretary-General's Special Representative, Albert Tevodjéré, in order to secure a lasting political solution to the crisis, in the spirit of national reconciliation which was established in October 2001, with due respect for the democratic institutions and unity of the national territory of the Republic of Côte d'Ivoire. The aim of the Linas-Marcoussis Agreement is to guarantee territorial integrity and respect for the country's institutions and their implementation must not serve as a basis for de facto partitioning of the country. By the end of 2003 stability, good governance and development remained out of reach because of inadequate United Nations peacekeeping troop strength, the possible repatriation of ex-combatants, the cross-border movements of foreign fighters and a lack of urgent financial assistance. Stabilizing Liberia is contingent upon the timely mobilization and deployment of required troops throughout the country, especially as UNMIL (UN Mission in Liberia) begins to disarm and demobilize combatants. At the same time, the Economic Commission of West African State (ECOWAS) has asked for the expansion of the small UN Mission in Côte d'Ivoire (MINUCI) into a full peacekeeping mission because the peace process remains deadlocked. The planned withdrawal of the UN Mission in Sierra Leone (UNAMSIL) could be affected by destabilizing factors, including the possible return of Sierra Leonean ex-combatants from Liberia and the need for forces to monitor the border with Liberia. The cross-border movements of foreign combatants fuel instability in West Africa.